My year of challenge-free reading is off to a great start! I found this book while visiting a great little bookstore on the Outer Banks of North Carolina. Even though I had plenty to read for a week of vacation, I’m always up for a trip to a local indie shop. I went in looking for The Storied Life of AJ Fikry and Unbroken and I came out with This is How I’d Love You and Sleepwalking. Ya’ll, I was captivated by this book. Although the premise is darkish and depressing, the story drew me in. Three college coeds are each obsessed with the works and lives of three famous poets who’s lives all ended in suicide. These “Death Girls”, as they are known around campus, become fast friends and they meet regularly in a candlelit dorm room to read and discuss and meditate on the works of their poets. Laura is obsessed with Anne Sexton, Naomi with Sylvia Plath and Claire, the protagonist, is an expert in a fictional-to-us-poet, Lucy Ascher. The Death Girls dress in black and actually look like the poets they adore. Now, I don’t mind dark themes if they provide thought provoking insight and I don’t end up feeling assaulted. To be honest, I don’t ever want to feel assaulted when I read, even for empathy’s sake. In the case of Sleepwalking, I found an ominous story I enjoyed that provided plenty to think about in terms of depression, grief and family dynamics. I would love to discuss this one in a book club because I just have so many thoughts. But hear me, the story in Sleepwalking is not my favorite part. It’s the writing. My word people! She wrote this book in college!! And it’s not so hard to understand that she could fashion a story about college students, being one herself at the time, but the maturity with which she tells her tale is incredible. I would expect that level of writing to come after years of perfecting her craft. It wasn’t the working of the words, it was, like I said, the maturity of thought and expression. I was impressed and quite frankly, jealous. She’s got a slew of other titles. The Wife has been on my radar a while and so has The Interestings. I’ll get to them eventually but since I started with her first one, I’m thinking I might as well just read her books in order. I don’t know, I’m reading freely this year so I’m not giving myself any official structure. 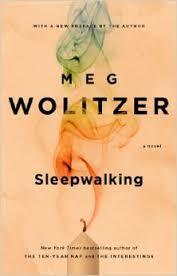 I know there are a ton of Meg Wolitzer fans out there. Tell me, have you read Sleepwalking? Which Wolitzer is your favorite? I have never heard of her but will def check out this book on my next trip to the library. Sounds great! !